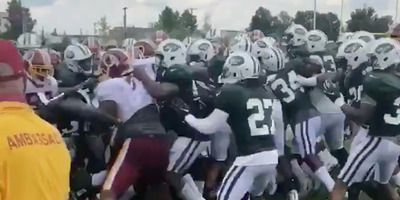 @BellyUpSports / TwitterThe Washington Redskins and New York Jets held a joint practice on Sunday that turned into a melee just a few days before the two teams are set to meet in a preseason game. The New York Jets and Washington Redskins got into a brawl that briefly spilled into the crowd during a joint practice on Sunday. The fight started after some Redskins players took exception to what they believed was a late hit on tackle Morgan Moses. It’s not the first time that the Redskins have had trouble during joint practices, having brawled with the Houston Texans back in 2015. The New York Jets and Washington Redskins joint practice on Sunday devolved into chaos, with both teams brawling in a melee that eventually spilled into the crowd. The conflict reportedly broke out after Washington tackle Morgan Moses took a late hit, prompting an initial shoving match and leading some players to throw punches. A few fan videos caught clips of the fracas as it erupted. After the ordeal, Redskins cornerback Josh Norman implied such conflicts were almost inevitable when teams suit up for joint practices. It’s not the first time the Redskins have dealt with brawls during joint practices. Back in 2015, the team got into it with the Houston Texans while preparing for the season.